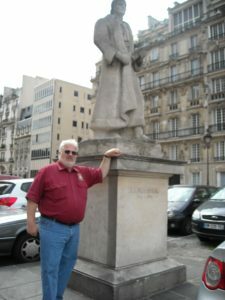 It would be fun to see how many Americans are aware of the fact that two of the three main governmental philosophers that inspired the authors of American self-government were French. Perhaps the concept of “freedom fries” should not be seen as critical of the French! 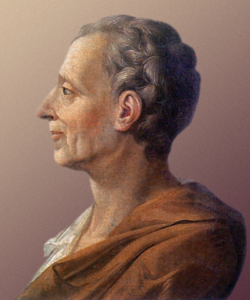 Baron de Montesquieu, or “Montesquieu” as most refer to him, made one of the most important contributions to the structure of how self-government could work. He theorized about the most critical element that would allow a representative government to wield sufficient power to run a nation the size of the new American republic (that would grow exponentially over the next 200 years) without giving way to a new tyranny, would be a divided government. It’s important to remember the issues that were most important at the founding of the new republic: taxation, representation, and a means of limiting the power of the new federal government so that the individual felt he still had control over most of his life’s work, ambition, and expression. Montesquieu’s solution was to divide the power. Almost every young child who has been taught about the US government over the last 100 years has heard the phrase “checks and balances.” Long before Americans became convinced of the “rights” of healthcare, income equality, or gender-neutral bathrooms, the main concern of the recently independent American citizenry was to protect against a new governmental tyranny. Montesquieu’s Spirit of the Law had the answer: divide the power into three branches. He identified the legislative, executive, and judicial as the three branches of the administrative government. He considered that separate from the ruling power of the monarchy. Still, his radical ideas got his work banned by the Catholic Church and the French government. But the new American revolutionaries, particularly James Madison, embraced his ideas and incorporated them into the new Constitution of 1787. All through the sweltering summer of that Philadelphia Convention, the attendees massaged Madison’s original Virginia Plan until the result assigned differing powers each of the three branches of the new Federal government they had created. They assigned the powers to each branch in a way that the other two branches kept any one branch from having too much power in any broad areas. The resulting year long debate over ratification of the Constitution in 1788 produced the amendments we call the Bill of Rights. These amendments were written in order to assure the people that the new government could not repeat the removal of individual rights they had seen occur under King George III’s Parliament in the years leading the the American War of Independence. Most of the issues addressed by the Bill of Rights were result of the Intolerable Acts that had been passed by Parliament as a response to the Boston Tea Party’s destruction of government property. But there were plenty of new problems they knew would arise as the nation grew, expanded, and matured. The population would continually transform through immigration and prosperity. Only the calculated competition for power between these three branches, structured by the administrative branches as articulated in the first three articles of the Constitution, could hope to restrict the power of a government’s natural inclination to impede and regulate the desires and designs of a new and ambitious populace. Power always seeks to be exercised. The Founders knew this and spent most of their efforts in writing the Constitution in debating how to limit the powers of the new federal government without handicapping it’s ability to carry out it’s main mission in protecting the new nation while allowing a certain amount of state autonomy. 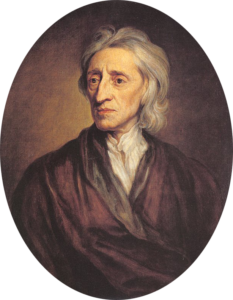 When one understands that the Constitution was designed to identify a contract between the government and the people (Locke), the people and each other (Rousseau), and the balance the power between competing branches (de Montesquieu) then you can understand that the Constitution was more about limiting the power of government than in identifying how the government should be more involved in regulating the lives of individual Americans. Click on the links from each name in the paragraph above to read my take on each man’s contribution to the philosophy of American self-government. I believe, contrary to popular opinion, that there are certain common thoughts that actually unite citizens of the United States of America. This may seem like an impossible dream considering the state of American politics and social discourse today, but I stand by my premise. As a former US history and US Government teacher, I taught and emphasized certain commonalities of principles, ambitions, dreams, rights, and beliefs that threaded their way throughout the term of the American Experiment. We constantly surprise even ourselves. I could easily point to all the examples of offenses, massacres, wars, injustices, and so on. American history is rife with them, and to our credit, we fess up to them and teach them in our classrooms. I did this for 14 years. My international students would ask how such things could happen. I would explain, “we are as human as everyone else.” So what is my explanation? We ARE everyone else. Every nation on this planet has had someone who has emigrated to the USA and become a participant in this republic’s development. I hope you will drop by, respond in the comments, and be a part of the discussion. I will endeavor to respond when possible and be available for explanations. One additional note: I intend to begin a weekly podcast. These will be a short story of someone who significantly contributed to the American experience. Some of them will be well-known, others will be completely unknown, but all should be stories that will surprise and delight the listener and perhaps make your commute or busy time a little more enjoyable.